When Upper Deck creates a product like Exquisite Collection Basketball, the company’s most premium basketball trading card release of the year, our Product Development Team is tasked with creating some items that will have considerable “Wow” factor. These drivers help make it an exciting break for collectors knowing they have the prospect of pulling some of these major cards. Such is the case with Upper Deck’s 16 signature cards in the set. These one-of-a-kind collectibles are presented in a booklet style trading card format and include some of the greatest players to ever play the game. So we asked ourselves, “What would it look like if we had THE BEST player in basketball today to sign and appear on one of these cards?” And voilà here it is with LeBron James. 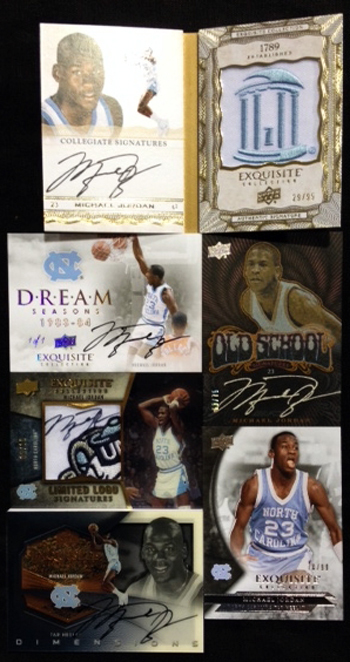 Then we asked ourselves, “What would it look like if we had THE BEST basketball player of all-time to sign and appear on one of these cards?” And like that, you now have this potential monster pull featuring Michael Jordan. It should be fun to see collector’s reactions when they pull these cards from packs. 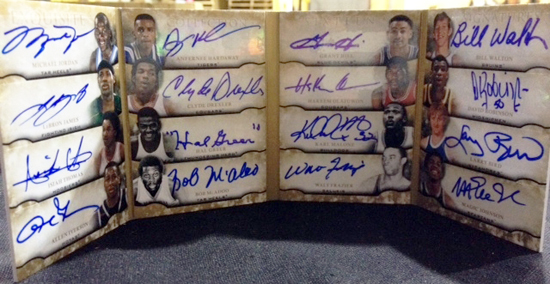 Another cool concept Upper Deck has incorporated in the production of the Exquisite Collection Basketball product is the creation of player-themed super packs. Collectors will open some packs that will contain either three or five different rare autograph cards from top basketball players like Michael Jordan and LeBron James. Recently the brand team hand packaged the latest Exquisite Collection Basketball product and snapped a photo of the contents of one of the Michael Jordan super tins. As you can see, the lucky collector who opens that pack may have a jaw-dropping, hand-shaking, jump-for-joy, scream-like-a-little-girl type of reaction discovering these contents all in one pack. 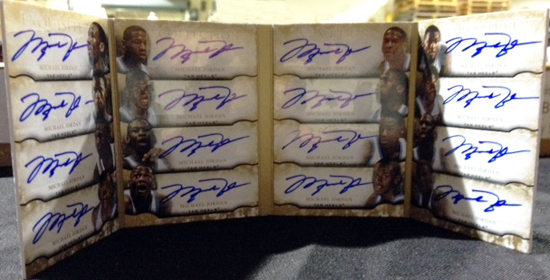 16 Lebron or 16 Jordan Autos on the same card… Stupidest thing I have ever seen. Can you possibly do anything more to kill the value of their autographs??? 16 autographs of the same player on one card? Why??? What’s the point of having 16 of the same player’s autograph on a card? It seems redundant to say the least. I would have rather seen a large card with a single auto and inscription in that same space. The stupidity of the 16 auto graphs of the same player is glaring to see. If it was 16 different players, then it would be a much better idea. I just wanted to give a response to the “why” question. When UD first came out with a dual autograph where Sidney Crosby signed a card twice, I had reservations as well. It was a card that was NOT for everyone, but there certainly were fans interested in it and they sold for some big bucks. They also got people talking. We’ve done more of that since then with success in hockey. With these 16 card booklets gaining in popularity, we wanted to get fans talking again and releasing these images certainly has done that. It is important to remember there are only one of each of these cards. Only one person can ultimately own them. We know well there are some VERY high-end collectors who will do a lot to be the owner of these two cards, particularly over seas. So is it silly or redundant? Perhaps. But once these get into the market and are eventually sold, you will be amazed for what these high-end Jordan and LeBron fans may be willing to spend to own these two cards. Who wins? The collector who pulled the card and maybe the industry as a whole as the sale of these cards shines a light on the hobby. Is this something we are planning to do more of? Likely no. This is our most premium basketball release of the year so it makes sense to spend a little more to do something like this here. These are UD’s two top spokesmen so we certainly are not going to saturate the market with their signatures by doing much more of this. Upper Deck has always pressed the envelope by trying new things that I will admit, don’t always work. More often than not however, they do. Only time will tell what fans ultimately think of these cards once they make their way to the market. In my opinion, the 16 signed card of Jordan or Lebron is fantastic! you can get a single signed by any of these stars or a multiple player signed card anyplace. pretty much every combo possible that can be done has been done before! This idea, however, is unique enough to generate buzz that no other multi signed cards will this year! what will thse sell for? I promise higher then any 16 combo! An overseas Jordan collector will die for the Jordan! Nicely wordly Chris! If you guys don’t like it just don’t buy. This is the most unique item I’ve seen from Upper Deck in years. So cut the slack and junk comments, we Jordan collector’s don’t need stupid comments telling upper deck what to do.